After making the controller part of the project, I turned my attention to the dew band. The main driver behind the whole project was to come up with a solution for dew building up on the secondary mirror of the SBT. However, I also come across the same issue when using the DSLR camera for night photography. This was the problem I chose to tackle first. 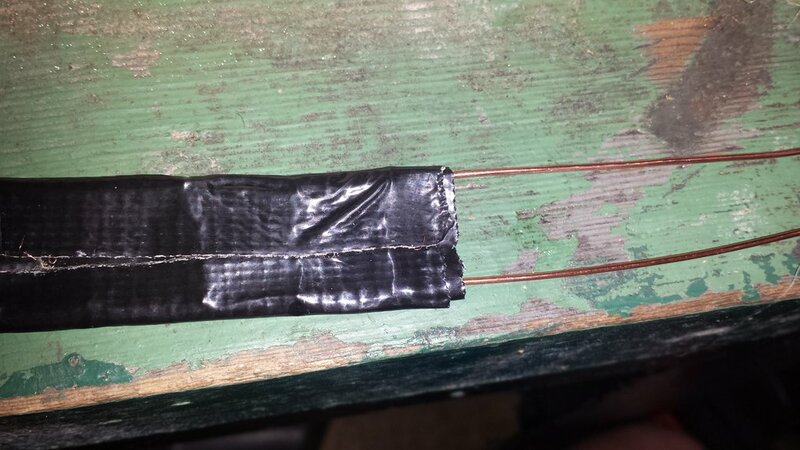 There are plenty of web sites and forums providing solutions for homemade dew bands using nichrome resistor wire. This is the same type of wire that is used in electric blankets. To start off with though, I decided to use a ‘ladder’ of resistors arranged in parallel. 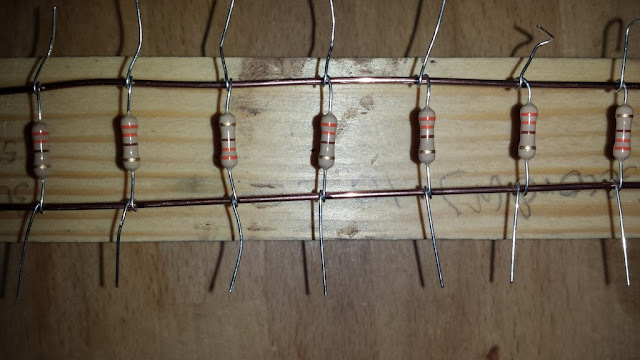 · The component parts of the resistor ladder require 2 lengths of copper cable, approx. 1.5mm square cross section. I had some twin and earth cable, which when stripped of the insulation provided me with the type of material I wanted. 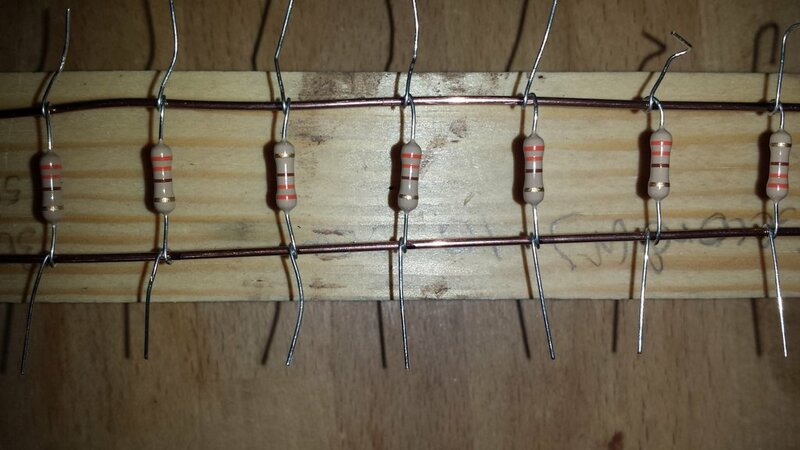 The resistors are 330 ohm resistors. 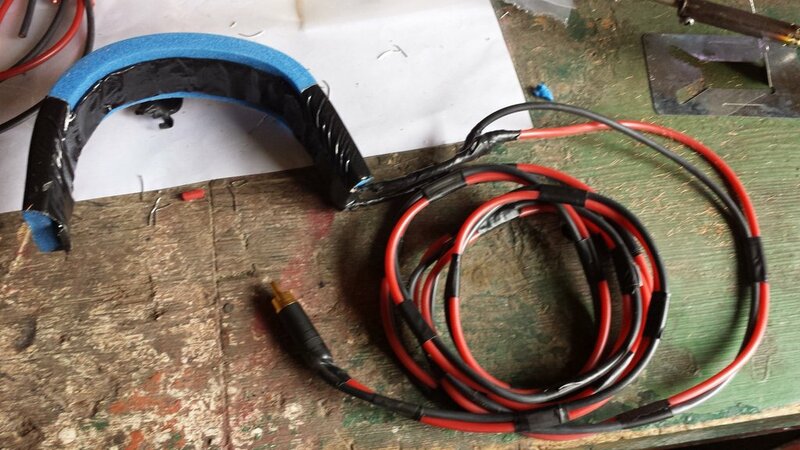 · Next, I took the resistors and started twisting them around the cable at intervals of around 1.5cm. The resistors forming the ‘rungs’ of the ladder. 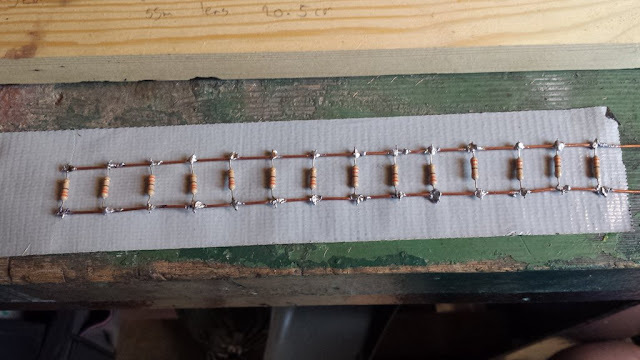 · In theory, the ladder of resistors can be any length, but the longer it is, the more power it will drawer. This design has been used from quite large aperture telescopes from what I have read. So, it should be ample for the requirements of my DSLR lens. I needed a total ladder length of 20.5cm. 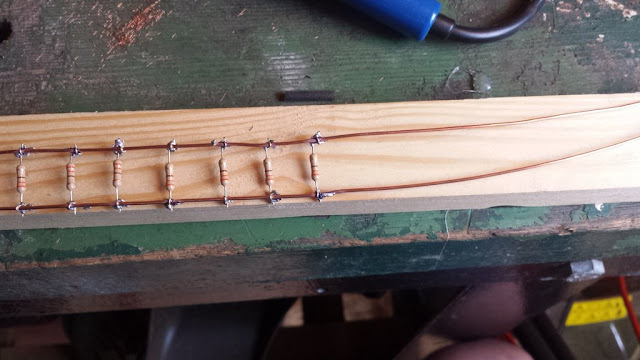 · I soldered the resistors into place, making sure that I had sufficient copper left at the end of the ladder to attach the leads that would ultimately connect back to the dew controller. · Having got this far into the project, I decided to run a test. In the previous part of the project, I only used 3 out of 4 of the PWM controllers that I bought, with the intention of using the 4th as a test rig. So, I used this to run a trial of if the process was sound. I started with a low setting and left the rig alone for a few minutes. At the lowest setting, I couldn’t detect much heat if any, so I checked the circuit with my multi meter. I confirmed that there was current flowing, so I turned the PWM to a higher setting and then left it for another few minutes. I could then start to feel some heath coming through. Finally, I turned the dial almost to maximum. The heat coming from the resistors then increased significantly to a point where I was able to touch them, but they were very warm. Test completed. · The next part of the build process was to start attaching in the ladder to some insulation. Firstly, mounting the ladder on some duct tape. · The ladder was then enclosed in duct tape, and using an off cut from an old camping mat, provided some insulation on one side of the ladder. · The insulation should help prevent heat escaping from the ladder into the air, meaning that less power should be needed to keep the resistors emitting a sensible amount of heat. 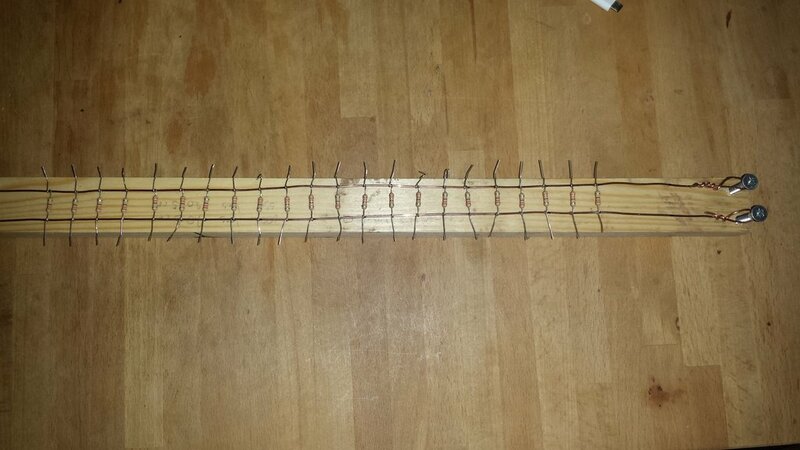 · Once everything was in place, I start to gently bend the resistor ladder into the right shape. I soldered the leads to the copper cable, and finished the band off by using insulation tape to cover up any remaining copper parts. The finished article is a bit rough and ready, but as a prototype, and a working demo, I look forward to finding out how it performs in the field. I can already see some improvements that could be made to the initial design. For instance, using thinner insulation. With the bend radius needing to be quite short, having the stiffness of the camping mat insulation could prove to be a bit of a problem. The ideal result is to have a model that holds the resistors in contact with the camera lens for the whole of its circumference. Having finished that build, I started to look at the heating element for the secondary mirror. I was evident that I needed a different design. Some solutions I have read about involve warming the stem of the mirror, and allow the heat to transfer to the mirror itself. Although there is a suggestion that by doing this, more heat is needed. Also, apparently there has been an instance of too much heat being generated, and the glue holding the secondary mirror onto the stem has melted, detaching the secondary mirror completely. 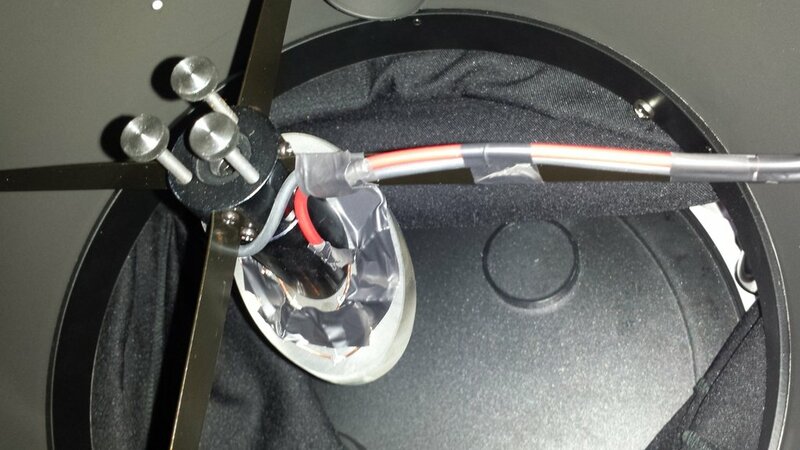 Others have just glued resistors directly to the back of the secondary mirror. I wanted to achieve a reasonably equal distribution of heat around the back of the secondary mirror. As the mirror is made of glass, the heat transfer properties of which are not brilliant, I started with an idea of distributing 5 resistors reasonably equally around the back of the mirror. · The first attempt at the secondary warming element looks similar to this. · Again, I connected it to the test rig, and this time, left the power switched on and at about 4/5 capacity for around 10 minutes or so. I was able to hold the rig and feel the warmth generated quite easily. Leaving it for a prolonged amount of time told me that the heat generated stayed constant. · The design allows the 5 resistors to maintain direct contact with the back on the mirror, making heat transfer possible. 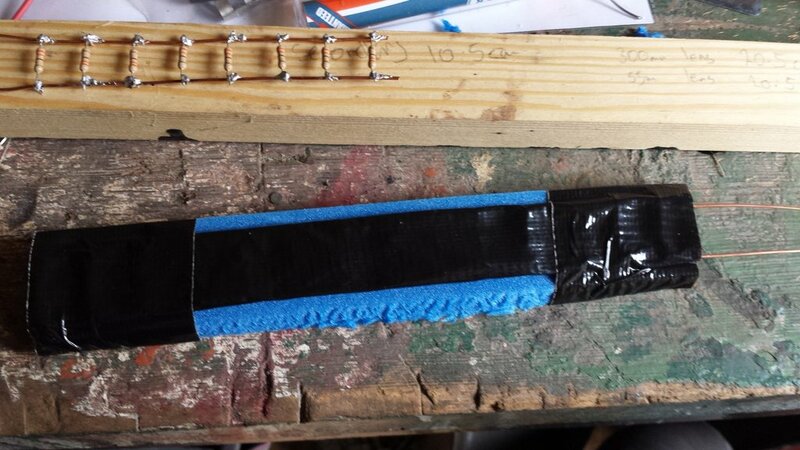 · For the moment, I have decided to just attach the element using normal insulation tape. This should be sufficient to give me evidence of the design working. · The design of the SBT scope allows for as much light as possible to enter the tube. Anything that is held in front of the telescope reduces the amount of light entering the telescope, so I needed to be aware of this when fitting the heating element. · I was able to arrange the leads from the element so they attach to one of the veins that hold the secondary mirror stem in place. 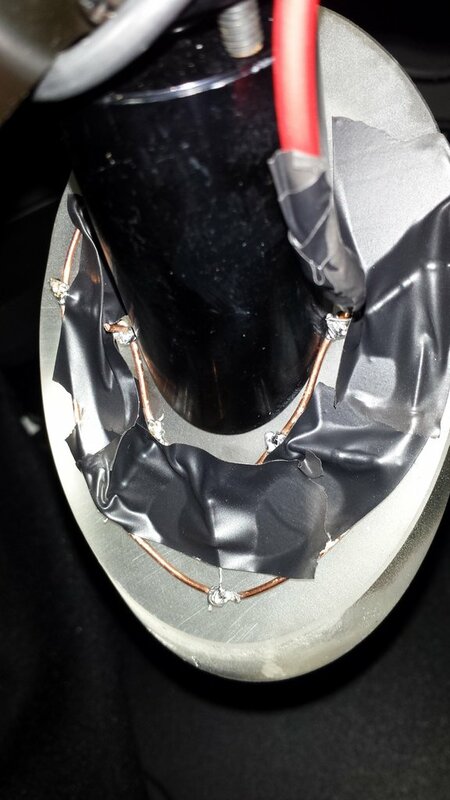 · All that is left is to now put some sort of insulation in place to stop too much heat escaping into the air, and allow more of it to be conducted into the glass of the mirror itself. So, in essence, that’s the end of the project. The proof of concept has been demonstrated, and the components work. They need to be run in the field to see how effective it all is.